the previous videos on the APP whenever you want. Saves your time and energy. You can also share the video with others such as Facebook and other social networking sites.  Screenshot: Easy to capture any important moment.  Premium Camera Len: 1080P Full HD video recording.  Remote Viewing Available: Live stream your video remotely.  SD Card Support: Supports up to 64GB Micro-SD Card (Not Included).  Play Back Function: Track footage easily, seeing what you want to in ease.  Portable Size: Tiny size in 1.8" x 1.8" x 1.2", perfect for covert & portable surveillance.  Plug into Wall for Long-time Surveillance: No worry about out of battery, our camera keeps recording 24/7.  Time & Date Stamp: With a few short steps, the camera time & date stamp will be in sync with your local time.  2 in 1 Function: Also works as an iPhone or Android Phone Charger, charging your device at the same time while recording.  No Indicator Light: Unlike other cameras, this camera has an indicator light but you can set up to turn it off. It is totally undetectable.  Please remove the black film on the screen before using.  To obtain the best performance, please read the instruction manual carefully.  This hidden camera is only compatible with WIFI 2.4GHz, does not support 5.0 GHz. ✔ Completely Unnoticeable Hidden Camera: This spy hidden camera is concealed in what looks just like a normal USB wall charger and it can be used to charge your device while recording, without drawing anyone's attention thus makes this hidden security camera completely unnoticeable. No one will find that you're recording video. 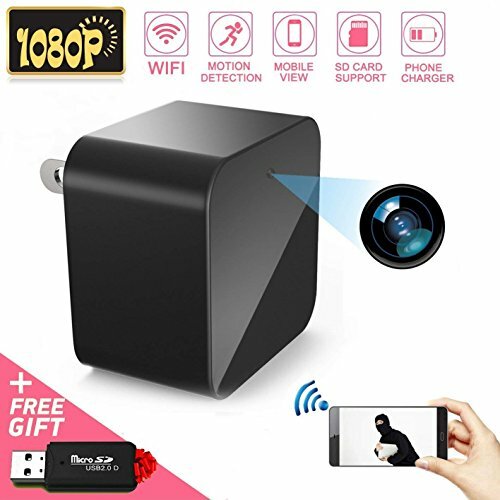 ✔ Live-Stream the Video Remotely: Just connect this camera to your house WIFI network, and then you can see what is going on in your place via the App (IOS & Android Available). Check up on your property in real-time on your phone or tablet, capturing every important moment. ✔ FULL HD 1080P Video: A high-definition image and video quality is crucial to monitor your home when you are away. This camera supports full HD video quality 1920 X 1080P 30 fps. High video resolution gives you a clear view of everything in details. ✔ Multiple Users: If you're not the only person that's in charge of keeping your property safe, or in case of missing a moment, you can share your login information with your wife, partner, or your colleague. This hidden camera supports multiple devices watching the live-feed online at the same time. ✔ Motion Detection & Notification Alarm: You can leave the camera recording 24/7 or set a motion detection mode- it will send you an alarm automatically when motion is detected and shuts off when there is no motion around. You just need to view the video online to see what's going on in real-time when you receive the alarm. No more unnecessary recording and concern. If you have any questions about this product by SpyStar, contact us by completing and submitting the form below. If you are looking for a specif part number, please include it with your message.